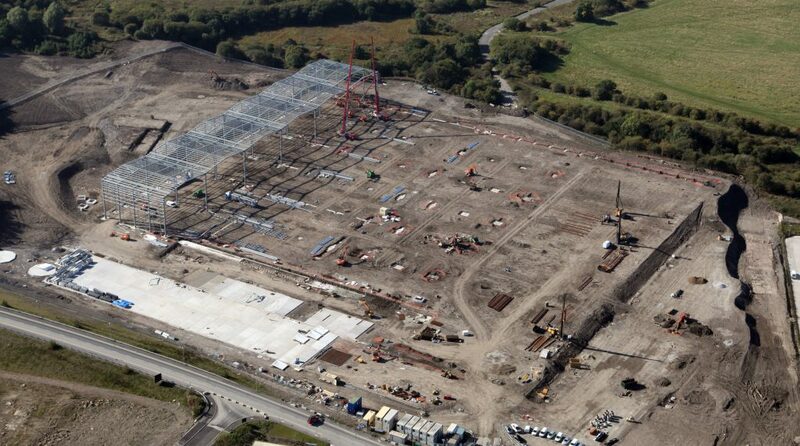 Construction of the new 543,620 sq ft Exertis distribution centre at Burnley Bridge Business Park is well underway, with 20 per cent of the steel framework now erected. Technology distribution business, Exertis, became the largest occupier to-date at the 70-acre park following the deal with developers, Eshton, back in March, which is believed to be the biggest distribution deal in the North West so far this year. Main contractor Bowmer & Kirkland began in July and so far nearly half of the service yard concrete has been poured, with all of the piling in place to support the weight of the building. Drainage, fencing and foundations work is also ongoing, and more recently, steelwork erection commenced with the first 200 tonnes of steelwork delivered to site. James Chapman, managing director of Eshton, commented: “The deal to bring Exertis to Burnley Bridge Business Park was a landmark for the region and us as a business, so to see the building finally taking shape is a huge step forward for commercial development locally. Steelwork erection will continue over the coming weeks, with precast concrete works and cladding set to commence later this month. More than 42 kilometres of steel tubular piles, 40,000 tonnes of concrete and 2,000 tonnes of steel are expected to be used on the site in total, and once complete, the building will be large enough to house five full-size football pitches. Bowmer & Kirkland expects to complete construction in May 2016 with the site fully operational by early 2017.